Wine has been made in Spain for five to six thousand years. Vineyards are as natural a part of the Spanish countryside as the hills and valleys that shelter them. Wine is made in every part of the country, in almost every style, and with ever increasing quality. There is more land under vine in Spain than in any other country, but they are only the third largest producer in the world, due to low yields. Irrigation was only legalized in 1996, so many plots still feature vines that are small, bush trained, and dry farmed – with some of the lowest densities in the world. The root system of a vine continues to grow throughout its life, and after many years of successive above-ground pruning, the nutrients available to each individual grape becomes immense. These traditional Spanish vineyards produce tiny amounts of fruit with extraordinary concentration of flavor. 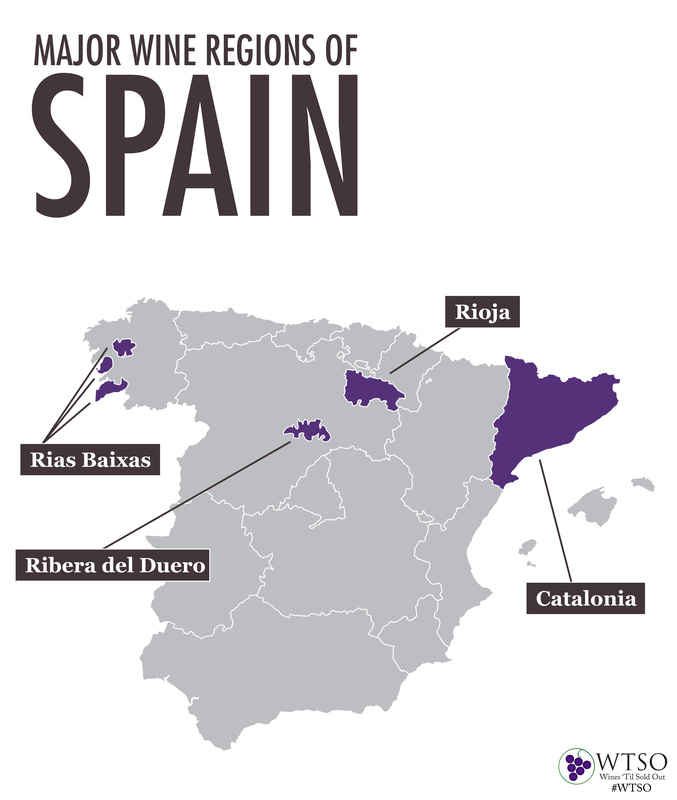 There are numerous wine regions in Spain worthy of exploration, but this article will focus on four of the most famous: Catalonia, Rioja, Ribera del Duero, and Rias Baixas. 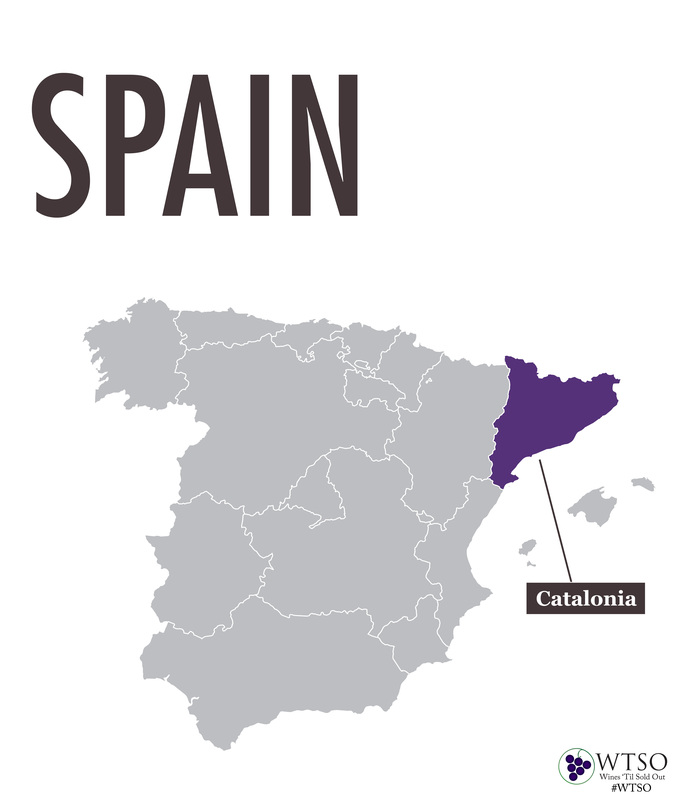 Catalonia, with its capital of Barcelona, is located on the Mediterranean coast by the French border. Many of the citizens of the area speak Catalan – a separate, distinct language from Spanish – and consider themselves to have a specific Catalan identity. In fact, there is a relatively robust secession movement that seeks independence from Spain. Catalonia is known for native Spanish wine varietals like Tempranillo, as well as international grapes like Cabernet and Chardonnay. Perhaps the most famous wine from Catalonia, however, is Cava. Cava is a sparkling wine made in the traditional Champagne method, primarily from three native grapes: Macabeo, Parellada, And Xarello. It can be made as a sparkling rosé, but the majority of Cava bottlings are white, inexpensive, crisp, dry, and refreshing. Rioja has historically been isolated from the rest of Europe by its inland position and lack of major trade routes. In the mid-nineteenth century, French merchants faced with vineyard devastation at home from powdery mildew and phylloxera arrived, and began to import large volumes of Rioja wine. This cultural exchange between France and Spain has been influential in Rioja ever since. Winemakers in Rioja often cite the wines of Bordeaux and Burgundy as influences, despite many of the wines of Rioja also sharing characteristics of New World wine. Spain’s historically brisk transatlantic trade with the Western Hemisphere lead to a wine culture that emphasizes American oak, rather than French. They also have a relatively warm climate that produces ripe, plush wines appealing to lovers of great California reds. The main grape of Rioja is Tempranillo, which is typically blended with small amounts of Garnacha, Graciano, Cabernet, Merlot, and several other indigenous varieties. White wine is also produced, but in more limited quantities. The wines of Rioja are classified according to how long they have been aged. Joven wines are young and released with minimal aging. Crianza and Reserva wines have been aged for a minimum of one year in barrel, and Gran Riserva wines for a minimum of two years. Ribera del Duero has begun to rival Rioja in recent years – both in production and in reputation. The famous winery Vega Sicilia in particular has earned a spot on the global stage for making some of the world’s most sought-after wine. Ribera del Duero has a high elevation and an extreme continental climate, with very cold winters and hot summers. The reward for facing such risky weather conditions is wine of exceptional quality. The best Ribera del Duero can be confused with top Cabernet Sauvignon in blind tastings, with its dark color, cassis, blackberry, dark cherry, full body, and hefty tannins. Galicia located in far northwestern Spain, has the greenest, wettest climate in the country. The subregion of Rias Baixas has a cool maritime climate, perfect for its aromatic indigenous white grape Albariño, which is comparable to Gruner Veltliner from Austria, or Pinot Gris from France’s Alsace. As in Catalonia, Galicians have a strong regional identity and their own language. Albariño has become fashionable in recent years, with enthusiasts who love its pure minerality, ripe peach flavors, and food friendly, acidic structure. As the wineries in Spain continue to innovate and improve the quality of their wine, we will see new and exciting bottles here in the US to explore. In addition to the regions we have covered, inquiring minds should check out wines of Priorat, Toro, and Sherry before looking into the rest of the varied and fascinating wines of Spain.